Ah, 29 weeks pregnant. The baby is still sitting up high but she's in the proper position, head down. My heart palpitations are terrible. I experience shortness of breath and my lung capacity is severely limited. I'm told by the doctors that the baby will "drop" soon and that this will allow my lungs to expand. The baby has pushed all of my organs together. 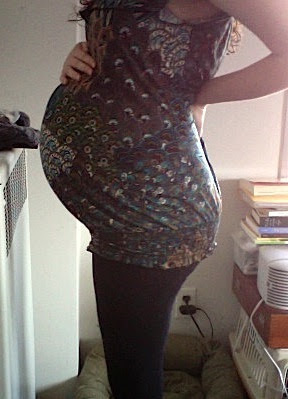 Here's a picture of me at 31 weeks pregnant. The baby has dropped and I can breath again! I feel some relief but now experience a new set of problems. My lower back is killing me! I waddle when I walk. My blood pressure is still fluctuating, but no preeclampsia yet. 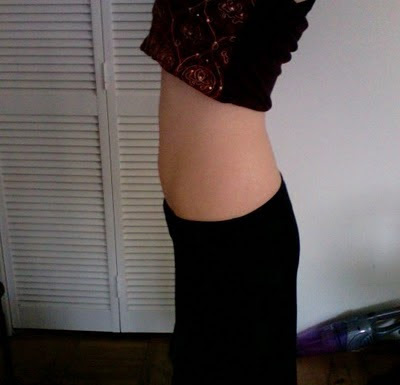 34 weeks pregnant. This is when it starts to get, er, exciting. So here I am, at my aunt-in-law's house, opening some family gifts for the baby. 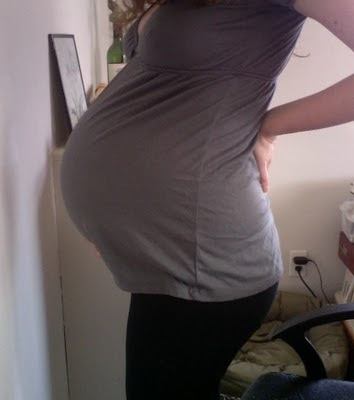 I start to experience severe back pain but don't say anything because I don't want to be a whiny pregnant woman. When I sit at the dinner table, I prop a pillow behind my back. We open baby gifts, life is good. After we arrive home, I go to sleep. I wake up in the middle of the night with severe back pain and slight cramping. The next morning, I call my mom and mention it to her. She tells me to go to the hospital. The back pain and cramping comes in waves, and I tell her it's pretty dull. She convinces me to call labor and delivery. I call and explain to them my situation and they tell me to come in right away. My husband and I are doubtful, but go to labor and delivery. They hook me up to monitors that measure the baby's heart rate and my contractions. "You're in early labor," they tell me. "You're having contractions." Woah! This totally blows my mind and I freak. I'm not ready. Plus, it doesn't really hurt. The doctor informs me that preterm labor is usually mild. The baby can come very fast with little warning. Still, they decide not to take measures to stop the labor because the baby is big and seems healthy. My contractions are steady but do not worsen. I find out I'm two centimeters dilated. I'm kept at labor and delivery for a couple of hours, but I don't dilate any more so they send me home. 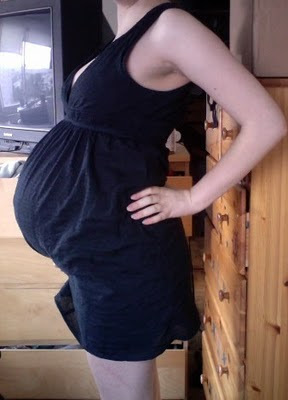 Below is a picture of me at 35 weeks pregnant. No baby yet, but I have to go to fetal testing twice a week in order for the doctors to monitor my contractions and blood pressure. There's still a concern that I might develop preeclampsia. Trace protein is discovered in my kidneys. It goes away when I drink a lot of water. The contractions are constant and doctors are convinced I'll give birth any day. 37 weeks and still no baby! I want her out of me so bad, but at least she's considered full term now. I'm still having contractions, not braxton hicks contractions, mind you, but real contractions. The doctors have labeled it a protracted labor, meaning that I've been having real contractions for weeks now but am only dilating slowly. It's not very common, but there you have it. The baby is very low. I'm beginning to retain water in my face and feet. I don't have preeclampsia, but I still feel terrible. The worst is having to pee every hour. I have to slowly scooch my way off of the bed. My lower half is so heavy, I've ripped the sheets. Yes, there are gaping holes in my sheets from my shooching. If I don't keep well-hydrated, my contractions are very painful. I have a couple of false alarm trips to labor and delivery. And you know what? These last pictures were taken at 37 weeks. 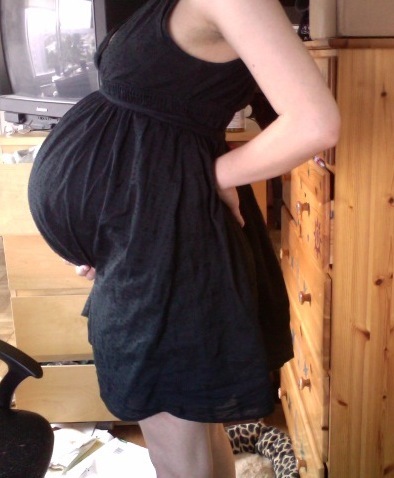 I don't give birth until 39 weeks, 6 days! I was huge! I couldn't even scrounge up the energy to take pictures of myself. I counted the weeks by watching Lost episodes. Every Tuesday night I'd tell my baby, "You can't come out now, just wait until I find out the smoke monster's next move."